The Inn & Spa at Cedar Falls is located one hour southeast of Columbus, Ohio, near the small town of Logan. Surrounded on three sides by Hocking Hills State Park, The Inn & Spa at Cedar Falls offers luxurious accommodation in a serene environment with easy access to the tranquil joys of the natural world. The inn is proud to be Green Certified for its environment-conscious practices. Hocking Hills State Park is a natural wonderland of stately pine and hemlock trees, gorges, and waterfalls, with trails to delight new hikers and wilderness old hands. The romantic and luxurious log cabins at Cedar Falls provide guests with everything they need for a perfect night or weekend away from home. 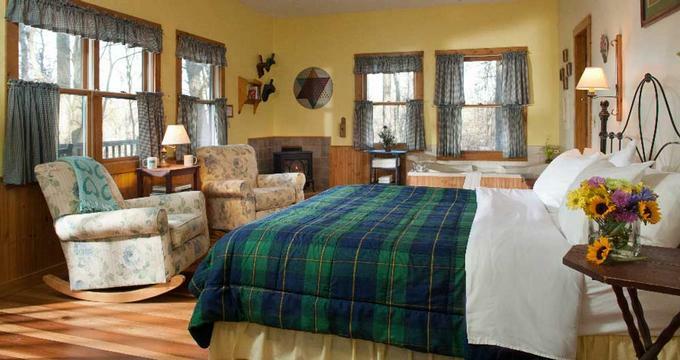 Guests can relax in the two-person whirlpool, cozy up on the porch swing overlooking the wilderness, watch DVDs on the flat-screen TVs, and warm up with fresh coffee in front of the gas log fireplace. Rooms are equipped with full kitchens, CD players, plush robes, hair dryers, irons and ironing boards, fine toiletries, and towel warmers. Upon arrival, guests are greeted with a plate of freshly baked cookies. Hickory Hollow Cabin sleeps up to six people on two floors, has a sunken living room, and a large porch overlooking a ravine. Redbud Cabin's main floor is handicap-accessible, and sleeps two to four people in two king-bedded rooms, each of which has a private bathroom. Dogwood Cabin has a unique mural in the gallery leading to the bedrooms, a spiral staircase, and private porches both upstairs and down. Strong Wolf Cabin is dog-friendly, and has a half-mile driveway. Guests interested in this cabin are advised to use a four-wheel drive vehicle to access it. It is a small cabin, suited to one or two persons; it has an open-plan kitchen and fine oak flooring. 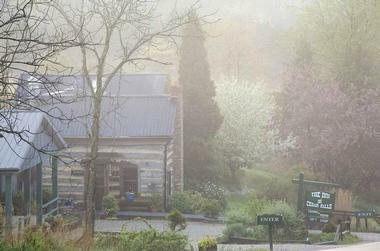 The Hocking Hills Cottages are set in a serene woodland glade. Each cottage has a two-person whirlpool, a gas log stove, free Wi-Fi, plush robes, quality linens and toiletries, towel warmers, a hairdryer, and freshly baked cookies upon arrival. 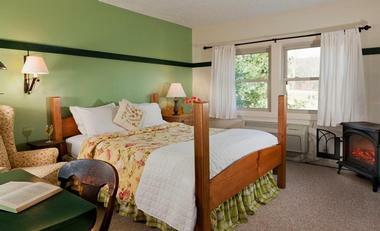 Cottages have either king or queen beds. Sumac Cottage is wheelchair-accessible, and Goldenrod, Yarrow, and Trillium cottages are dog-friendly. Located in the small town of Logan, Ohio, the Hocking Hills Bed & Breakfast establishment offers rooms with either one queen or two twin beds, and a delicious breakfast each morning. Each room has a small fridge, a small writing desk, and is decorated with country antiques. Coffee, fine toiletries, plush robes, and hairdryers are in every guest room, as are freshly baked cookies upon arrival. 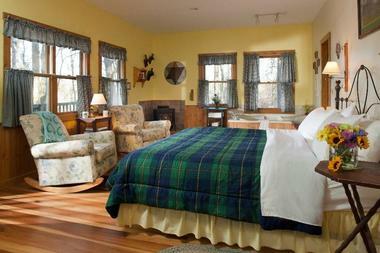 In the Common Room at Hocking Hills B&B, guests can socialize, read, play cards, or warm up by the wood-burning stove. Outside the Common Room is a veranda with rocking chairs, overlooking the inn's garden. Kindred Spirits restaurant seats 45 people in two log cabins. The atmosphere is quaint, intimate, and casual; the food is one-of-a-kind and exquisite. 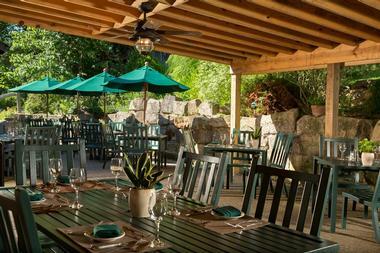 A seasonal patio allows more guests to enjoy the restaurant's fine fare. Kindred Spirits' kitchen is an open one, allowing guests to watch the preparation of their meals. The menu changes seasonally, and uses locally-grown and raised food. Bed and Breakfast guests enjoy a hearty meal with hot and cold offerings. Coffee and several different juices are available, as is homemade granola, and fresh fruit. Savory and sweet hot dishes are served at every breakfast, in addition to applewood-smoked bacon and sausages. For an extra fee, breakfast can be brought to your room. Lunch at Kindred Spirits is casual. Menu offerings include soups, salads, burgers, sandwiches, and excellent desserts. A children's menu is available. Dinner is fine dining, and features the best of American cuisine, with an emphasis on seafood. The Spa at Cedar Falls is small and intimate. Each spa guest receives a consultation with a trained therapist, a mug of herbal tea, a soothing neck pillow, and bottled water and snacks. The spa menu is varied and original, and includes traditional favourites alongside innovative treatments. The Spa Sampler combines three of the spa's most popular treatments. Guests receive a 25-minute massage, a 25-minute facial, and a choice of a 25-minute hand or foot massage. The More Than Yoga Class is for individuals only, and is designed to extend the body's range of motion using creative moves. The Pawpaw Facial and Massage Duet is available from August to October. It combines a pawpaw facial with a 25-minute relaxation massage. The facial is a combination of pawpaws pounded into a scrub with oatmeal, yogurt, and honey. It is left on the skin so that the nutritional benefits of it have time to soak into the skin's layers. The Warm Bamboo Massage is an Asian treatment where bamboo sticks are used for massage instead of hands. Tension melts away and the spirit is soothed. The Thai Yoga Massage is based on yoga and Ayurveda. Guests are posed in yoga postures while the therapist uses a thumb or the palm of the hand to run along the energy lines and pressure points of the body. Weddings at The Inn & Spa at Cedar Falls are rustic and lovely. A wedding planner is available to help couples plan every detail of their small gathering of up to fifty guests. There are a variety of venues available indoors and out, and meals can be buffet-style, a five-course meal, or an outdoor BBQ at picnic benches. The inn has a wide array of fine wines, champagne, spirits, and beer to quench the thirst of wedding guests. Venues vary in size and atmosphere. The Gathering Space is a fully handicapped-accessible space with an open layout, partially built from an 1840s log cabin. It has gorgeous views, warm natural lighting, and a covered wraparound porch with comfortable chairs and rockers. The Fireside Lounge is for small weddings, and has an intimate feel. The room has wide windows, a log fireplace, and a covered porch outdoors. 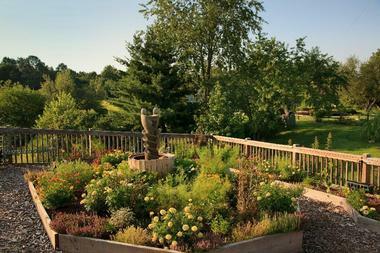 The Hilltop Garden is landscaped with local flowers, fruit trees, and benches. The Rooftop Terrace is a rooftop herb and flower garden adorned with walking paths and a gazebo in which to have the wedding ceremony. Meetings at The Inn at Cedar Falls combines a tranquil setting with excellent business facilities. Set-ups are available for meetings whether they be in a theater setting, around a boardroom table, or in a classroom. Venues are available for cocktails, for receptions, and for coffee breaks. The inn's event planners can help prospective guests choose from the full-service menu and from the varied meeting venues.